Alpacas are camelids that, like llamas, hail from South America. 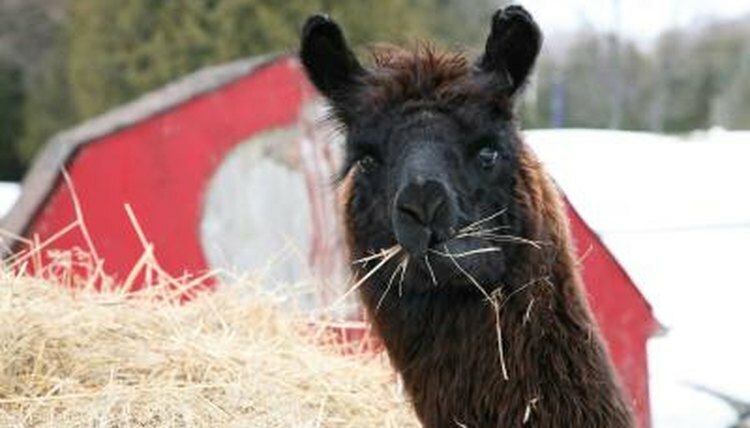 Prized for their soft fleece, alpacas serve double duty as guard animals for smaller livestock and chickens. While they can't take on huge predators, they're quite effective at keeping foxes and smaller carnivores away from their charges. Their llama cousins have the same guarding instincts. Domesticated for millennia and gentle in appearance, alpacas are actually tough little camelids. They mature to approximately 39 inches high at the shoulder or less, and they weigh about 125 pounds. Even though they're smaller than llamas, their fleece is so dense it produces more usable fiber. Alpacas are social by nature, so you must keep two at the very minimum. As herbivores, they thrive on the same pasture foods as other hooved species. As prey animals themselves, alpacas are always on the alert. In their native lands, foxes are known to attack baby alpacas or crias. Much like donkeys, alpacas have developed an aversion to all things canine. For that reason, it's best not to let even well-behaved dogs in the vicinity of alpacas. If a predator goes after a cria, the mother and her companions will chase it out of their field. Alpacas have been known to stamp a fox to death if they corner one. Your best bet as a guard alpaca is likely a wether, or castrated male. He'll identify sheep or goats -- or chickens -- as his herd, which brings out all his protective instincts. He has no interest in breeding, so he focuses all his attention on his guardian duties. Keep at least two males together for guarding purposes. According to South Africa The Good News, one pair of alpaca guardians can protect up to 250 ewes. South African sheep farmers using this form of predator protection report a drop in livestock loss as much as a 90 percent since using alpaca guardians. Alpacas can run quite fast, so they're able to overtake most predators invading their territory. Once they get close enough, guard alpacas kick, make loud, high-pitched noises and spit at the invader. If the fox has any sense, he gets out of Dodge before being trampled to death. Maryland Alpaca Breeders Association: What's the Difference Between an Alpaca and a Llama?